A bright spot in an otherwise disappointing 5-2 loss to Bound Brook yesterday, Emma Corbett '16 reached the 100-hit milestone in the sixth inning. A day earlier, Corbett launched a two-run homerun in the bottom on the first on two outs to help the Knights to a 6-3 win over South Hunterdon. That game clinched the Skyland Conference Mountain Division Championship. Tonight, Emma is being honored at the Somerset County Scholar Athlete awards ceremony. 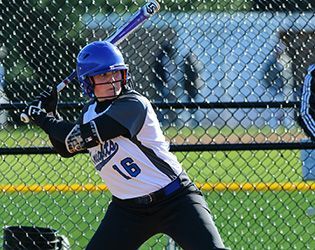 The softball team is currently 11-3 for the season and will face Somerville this afternoon for the second round of the Somerset County Tournament. When asked about this year's squad, head coach Nicole Spiotta said, "We have had a fantastic season so far, scoring runs and making big defensive plays when we needed them. Most important though is the way the trio of senior girls, Emma, Sam Delehanty and Kaitlyn Moriarty—all of them four-year varsity contributors—have really set the tone for the younger girls on the team." She added, "Maddie Bedrock '17 and Grace Beveridge '18 and a lot of the younger players have really stepped it up to keep us competitive, and a lot of that comes from the great example these seniors have set."